Nis America annuncia tramite comunicato stampa la data di uscita di GOD WARS The Complete Legends, versione per Nintendo Switch di GOD WARS che include anche l'espansione Legend of Yomi, che sarà disponibile a parte per tutti i possessori della versione PS4 e PS Vita. 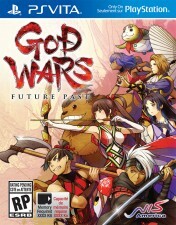 Get ready to dive into the legendary and definitive experience of GOD WARS The Complete Legend! We have a brand-new Overview Trailer featuring the cast of GOD WARS, its beautiful and lush world, and the epic battles you'll face with the gods! With refined gameplay mechanics and a Nintendo Switch version exclusive character named Orihime, you'll want to relive Japan's legendary tale of war, valor, and friendship. GOD WARS The Complete Legend arrives on Nintendo Switch September 4 in North America and August 31 in Europe.